Where V is the voltage source, VLED is the LED voltage and I the LED current. This way you can find the right resistor for LED. LEDs are also available in an integrated package with the correct resistor for LED operation. This simple circuit might be used as a power-on indicator for a DVD player or a computer monitor. Although this simple circuit is widely used in consumer electronics, it is not very efficient since the surplus of energy of the voltage source is dissipated by the ballast resistor. Therefore, sometimes more complex circuits are applied with better energy efficiency. The resistor must have a resistance of 333 ohm. If the precise value is not available, choose the next value that is higher. Often multiple LEDs are connected to a single voltage source with a series connection. In this way multiple resistors can share the same current. Because the current through all LEDs in series is equal, they should be of the same type. 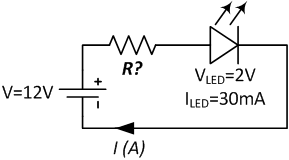 Note that lighting one LED in this circuit uses just as much power as multiple LEDs in series. 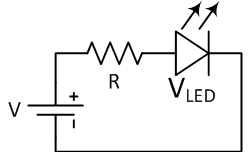 The voltage source must provide a large enough voltage for the sum of voltage drops of the LEDs plus the resistor. Typically the voltage source is 50 percent higher than the sum of LED voltages. 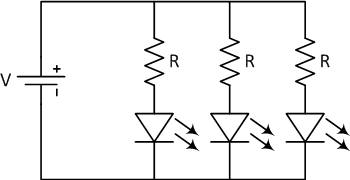 In contradiction, sometimes is chosen to have a lower voltage source. In this strategy, the lower brightness is compensated by the larger number of LEDs. Furthermore, there is less thermal loss and the LEDs have a higher lifespan due to the lower load. The resistor must have a value of at least 183.3 ohms. Note that the voltage drop is 5.5 volts. It would have been possible to connect additional LEDs in the circuit. It is possible to connect LEDs in parallel, but it gives more problems than series circuits. The forward voltages of the LEDs must closely match, otherwise only the lowest voltage LED lights up and possibly burn by the larger current. Even if the LEDs have the same specification, they can have bad matching I-V characteristics due to variations in the production process. This causes the LEDs to pass a different current. To minimize the difference in current, LEDs in parallel normally have a ballast resistor for each branch. An LED (Light Emitting Diode) is semiconductor device; it is essentially a P-N junction with a lead attached to each side. An ideal diode has zero resistance when forward biased and infinite resistance when reversed biased. In real diodes however, a small amount of voltage must be present across the diode to make it conduct. This voltage along with other characteristics is determined by the materials and construction of the diode. When the forward bias voltage becomes large enough, excess electrons from one side of the junction start to combine with holes from the other side. When this occurs, the electrons fall into a less energetic state and release energy. In LEDs this energy is released in the form of photons. The materials from which the LED is made determine the wavelength, and therefore the color of the emitted light. The first LEDs were made with gallium arsenide and gave off a red light. Today an LED can be made from a variety of materials and can emit a range of colors. Voltages vary from about 1.6 volts for red LEDs to about 4.4 volts for ultraviolet ones. Knowing the correct voltage is important because applying too much voltage across the diode can cause more current than the LED can safely handle. LEDs today are available in low and high power. LEDs typically give off less heat and use less power than in incandescent bulb of equal brightness. They last longer than equivalent light bulbs. LEDs are used in a wide range of lighting and light sensing applications. LEDs can be used as photodiodes. Photodiodes are semiconductors that behave in the opposite manner from LEDs. Whereas an LED will emit light as it conducts, a photodiode will generate current when exposed to the correct wavelength of light. 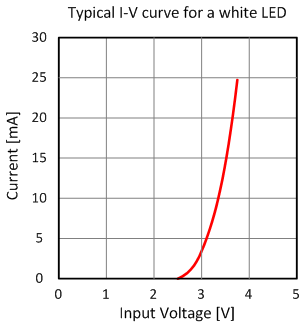 An LED will act exhibit this characteristic when exposed to light at a wavelength below its normal operational wavelength. This allows LEDs to be used in circuits like light sensors and fiber optic communication circuits.